A slideshow and collage of pictures of yourself on your bio page? That seems just a little bit self-absorbed, doesn't it? Not necessarily! To show you that Brian goes against the status quo whenever he can, just may make someone a bit uncomfortable in the process and doesn't take himself very seriously as well as to show you that behind every traditional headshot (at least for Brian) there are a plethora of other pictures that show the "real" person. Brian has spent the last several years advocating for authenticity--so why not show it in his headshots? And with his fantabulous (yes he likes to make words up too) professional photographer wife behind the camera, this is definitely the real Brian on film. Brian and his wife take a "silly selfie" before every dance event or performance! You are probably here to get all of the professional details about Brian such as where he graduated from, what sort of certifications he has, the clients he has worked with, where he has presented and the like, and don't worry, you will get that information soon. Those details are key in helping you make an informed decision as to whether or not Brian may be a good fit for your event or business. First though, Brian wants to make sure you know a few other (and more important) things about him, because when you hire Brian, you aren't just hiring his knowledge and experience, you are hiring a real person...that is anything but "typical". In college Brian double majored only to find out right before graduation that he was one credit short of getting both degrees--so the school let him create his own degree that combined both of his majors. Oh and he also asked if he could speak at graduation because, why not? Almost five years ago Brian and his wife went on a group outing with friends to an Arthur Murray dance class. Fast forward to now...Brian will argue that he is not a ballroom dancer, but many people beg to differ--multiple lessons and classes each week, dance competitions and routines under his belt (with more on the horizon) and a goal of being the best amateur west coast swing dancer in the state. Pretty sure that screams "ballroom dancer" even if he won't admit it. 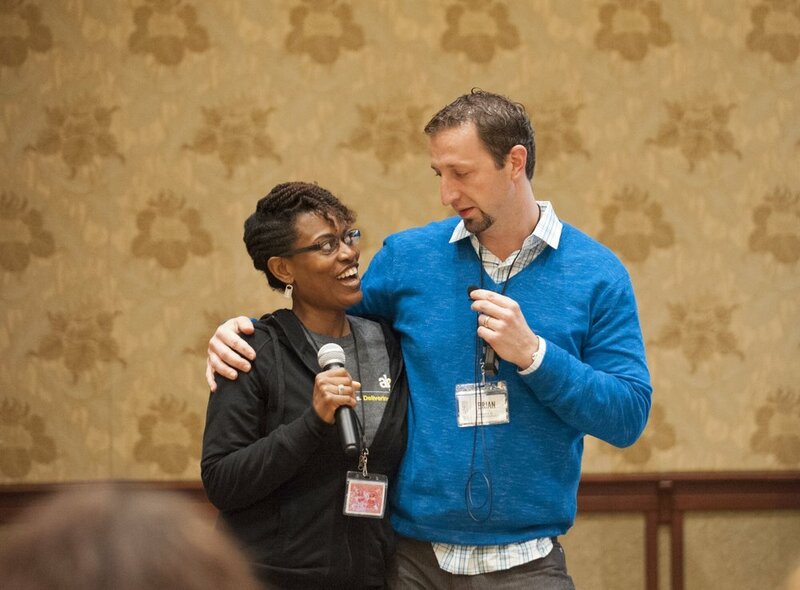 While he won't admit to being a ballroom dancer, Brian will admit that ballroom dancing has direct connections to areas he focuses on with clients and presentations: community, leadership, motivation, visualization, etc. and has given him a lot of insight and material that he uses in presentations, workshops and the like. Aside from his relationship with Christ, the most important thing in his life is his family. Him and his wife were just 17 and 18 years old respectively when they met and she knew he was the one on the first date! He took just a tad more convincing. Brian is a "person of possibility"--he rarely ever takes "no" for an answer and tries to push the boundaries to see what really is possible...in life, in work and wherever God is leading him. He has been known to build a barn door, prepare a workshop presentation, pick his girls up from school and bake a carrot cake from scratch all in one day. Brian is big picture, grand idea, why not, let's do, go for it, vision-driven, rock the boat, empower others, all in and creative mastermind all rolled into one. At 24 years old he asked his then employer if he could be part owner of the company...because, again, why not? Oh, and the answer was yes. Brian knows he is not perfect, has many flaws and will fall down over and over again...which is why he has a savior, makes goals, plans with a vision and has an extremely patient wife who balances him out perfectly. Him and his wife run their own businesses yet work together way more than they ever thought they would...which is kind of like on the job marriage counseling. On any given day, Brian is known for drinking 12+ shots of espresso--something has to keep that creative brain fueled! Brian takes great joy in being constructively disruptive and helping people and organizations think and act in ways that facilitate their success and see what really is possible. Brian speaks and consults with people and organizations to inspire more meaningful, strategic and joyful employee experiences. He believes that to change the culture of a workplace we must be focused on long-term objectives and that are supported with the right infusion of strategy, science, creativity, and “Edutainment”. Along with being the cofounder and facilitator of Wellness Underground, Brian has also started and led several networking groups across the U.S. around employee health & productivity and facilitated the technology start up, Quantified Habits. Brian holds a Bachelor’s degree in the Psychology of Sport and Exercise from Warner Pacific University in Portland, Oregon and a Master’s degree in Sport Psychology from Springfield College in Springfield, Massachusetts. He is a Certified Personal Trainer by the National Strength and Conditioning Association, has served as an adjunct faculty member for Elms College, and has extensive experience working with the Y.M.C.A and Boys & Girls Clubs where he focused his efforts on helping children develop an enjoyment of physical activity throughout their lives. When he is not trying to improve the culture, community leadership, experience and productivity of an organization, you can find him teaching his children about the finer points of woodworking and DIYing a Victorian house while making a carrot cake from scratch at the same time. Originally from Oregon, Brian calls Windsor, Connecticut home, with his wife and three daughters. book brian now! contact him for more information!